In the Marche region the passing of the seasons and the rhythm of the works in the countryside still mark the days as it used to. Tradition and history are strongly rooted factors in this place, which is also known as the “hidden diamond of central Italy”. Le Marche does not clamour or scream to show off its beauty. This region prefers to whisper slowly, almost timidly, just long enough to make itself known better. Among the peculiarities of this region we certainly find hospitality and warmth, two important characteristics that do not stop at the threshold, but are part of the DNA of its inhabitants as a distinctive and unique feature. In this short trip we will talk about the 10 good reasons to live in the Marche – in fact – we will whisper them. The Marche region is not one of the overcrowded destinations, where you stay in a queue for hours, but don’t let yourselves be tricked. Rich in monuments, churches, famous people and history, in this region there are destinations of global importance, such as Loreto, a pilgrimage destination second perhaps only to Lourdes. Among its pearls, we can list Fermo, a hilltop town with a strong medieval mark and with its famous Roman cisterns. And then again Macerata with its Sferisterio, the semi-circular outdoor theater that hosts one of the most applauded lyric seasons in the world, or Acquaviva Picena where you will find a wonderful fortress – perfectly preserved – dating back to the 13th century. These are just some examples of a land rich in history. If you are looking for a region full of charming little villages, where you can breathe history, traditions and listen to some legends, you are surely in the right place. The Marche is a region with a strong medieval character, with some of the most beautiful castles and hamlets perched on top of the marchigiano hills. To name but a few, Gradara is the home of Paolo and Francesca (the lovers quoted in Alighieri’s Divine Comedy). Corinaldo is known for its massive, intact walls. 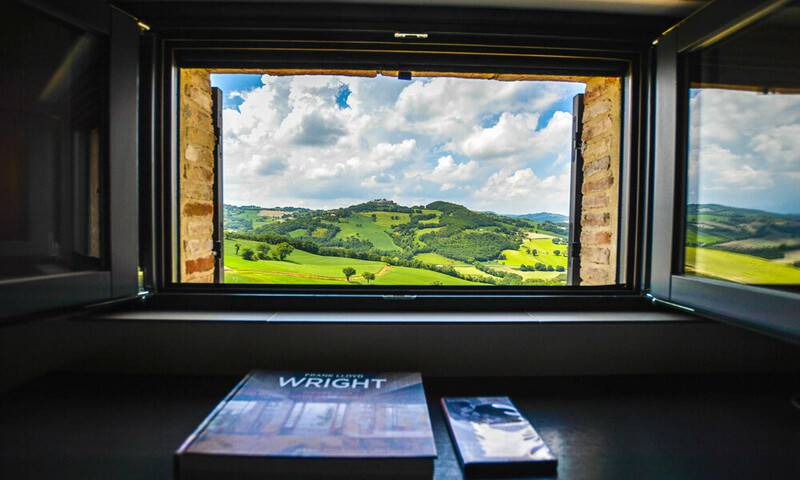 Cingoli, the “balcony of the Marche”, is famous for its breathtaking views. Torre di Palme is known for being the port of Roman wine. Many other towns are officially listed among the “Most Beautiful Towns in Italy” and they all deserve a visit. For food and wine, the Marche is second to none. In fact, it represents an excellence in the national territory, thanks also to its central position that combines culinary traditions from the north with those from the south of Italy. In addition to this, food and wine in the Marches also have a deeply rooted regional connotation. Only in the Marche region you can taste the true flavor of its typical dishes: Olive all’Ascolana (fried olives stuffed with meat), vincisgrassi (a kind of lasagna), Prosciutto di Offagna PDO (ham from Offagna), and Ciauscolo (typical soft salami with an extraordinary flavor). As for the wines, region Marche can offer a very wide selection; definitely worth trying Verdicchio di Jesi (white wine) and Rosso Piceno Superiore (red wine). The sea in the Marche is not just a source of food with its waters rich in fish, but also a source of tourism, thanks to its clear waters, services and high-quality holidays. In 2018, 16 locations have been awarded with the Blue Flag, a recognition that testifies the cleanliness and unspoilt nature, as well as the culture of hospitality in the Marche region. Among the most sought after destinations, the beaches of the marvelous Riviera del Conero. As a hub of high quality Italian footwear, the Marche is home to the most famous brands in the industry, such as TOD’s, Prada, Nero Giardini, and of course the related outlets and dedicated shopping centers where you will find these and many other luxury brands. In this regard, Casette d’Ete hosts one of the most famous Marchigiano Luxury Outlets, where you will find many offers for very interesting prices. We have already talked about the pristine beaches, but the Marche region has much more to offer. At the back of the sandy beaches, the Sibillini Mountains stand out. The Sibillini are a nice winter tourism destination with some of the most famous ski resorts in Italy and they are beautiful also in the summer, as you can go hiking or just escape from the heat of the coast. In addition to beaches and mountains in the Marche you can also admire the famous Caves of Frasassi, exciting natural underground cathedrals, unique in their kind and famous for being the biggest natural caves in Europe. The Marche region, located in the center of Italy which is already in itself a more temperate area, enjoys a very special climate, never too cold and never too hot. Thanks to its strategic position, the seasons alternate in a natural and rather precise way, as you expect them, without too many surprises and without disastrous weather phenomena, that we can see in other areas of the world. There are hot summers, which allow you to go to the beach, but they are not torrid, and there are cold winters, but never too cold. Marchigiano people are quiet, they live in a relaxed and not frenetic pace like that of a big city. Their culture has its roots in rurality, where the guest is always treated with respect, and which is always offered the best products to. At the beginning they are shy but, once the ice is broken, they become loyal friends, you can always rely on. They all know each other in small villages, and above all they help everyone. Human warmth, relationships with others, a nice word, a smile, in the Marche are still a daily reality, both for those who have always lived there, and for those who choose to move there! In Le Marche you can live well and this is a fact: relaxation, healthy food, clean air. But above all, acceptable cost of living. We are not in a big center where everything has a high cost and, especially if compared to quality, everything costs very little. If you love the small shops in medieval towns where you can buy specialties that you will not find online or in large cities, here there are many, that you will immediately love. Without any doubt, its geographical position makes it a very interesting place to live, not too far south from major cities such as Bologna or Milan, nor too far north to reach beautiful places like Puglia. Just three hours drive from Rome, a few steps from Rimini for lovers of clubbing, an hour from Umbria where nature and spirituality merge together into something unique and breathtaking. Here time seems to have stopped, keeping a slow flow, free from frenzy and stress, perfect for those who do not like the crazy rhythms of metropolis or for those who are escaping from them. In fact, there are many reasons – definitely more than 10 – for living in the Marche or simply to come and visit this amazing region. By the way, traveling is a continuous discovery and we prefer to leave you the beauty of finding your good reasons (and maybe let us know) to choose this authentic and fascinating region as your next destination.